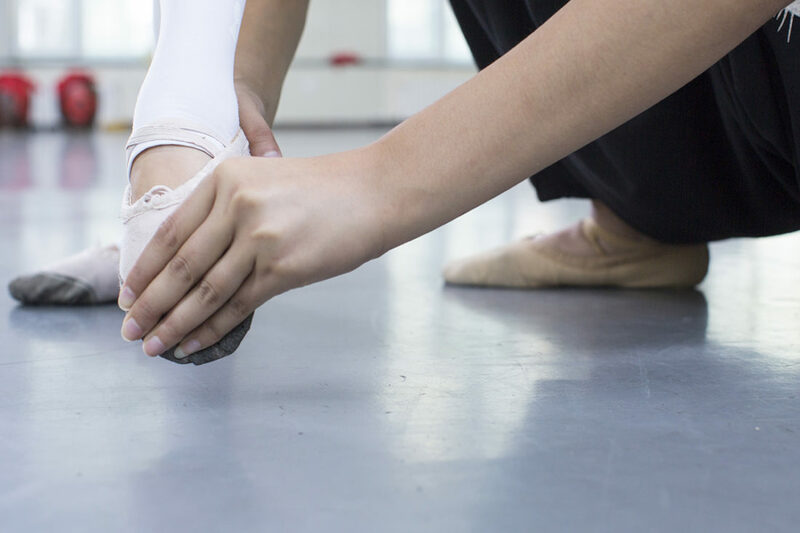 When studying new dances, Jiaojiao listens to the accompanying music every morning and evening. After a while, she learns to associate the music with the dance. “My heart beats with the rhythm when I feel music,” she says. “I become one with the music, it’s in my heart.” Jiaojiao likes melancholy pop songs and sings along to them. Sometimes she improvises a dance for the songs and on occasion they move her to tears. 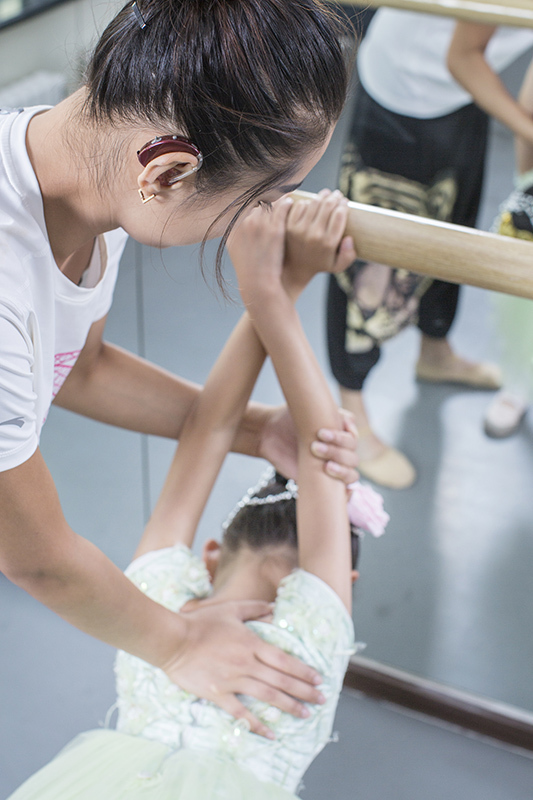 In addition to her work as a freelance dancer in various troupes, Jiaojiao teaches ballet to children. “I love teaching children and encouraging them. My dream is to have my own dance school one day. Dancing makes me happy and I want to pass this on,” she says smiling. Today she is teaching an 8-year-old who is accompanied by her grandmother. The girl, who has normal hearing, places her leg on the wooden ballet bar. Jiaojiao stretches her back by gently pressing it to the side, laughing as she does so. “My granddaughter loves this teacher and the way she teaches,” says the grandmother. 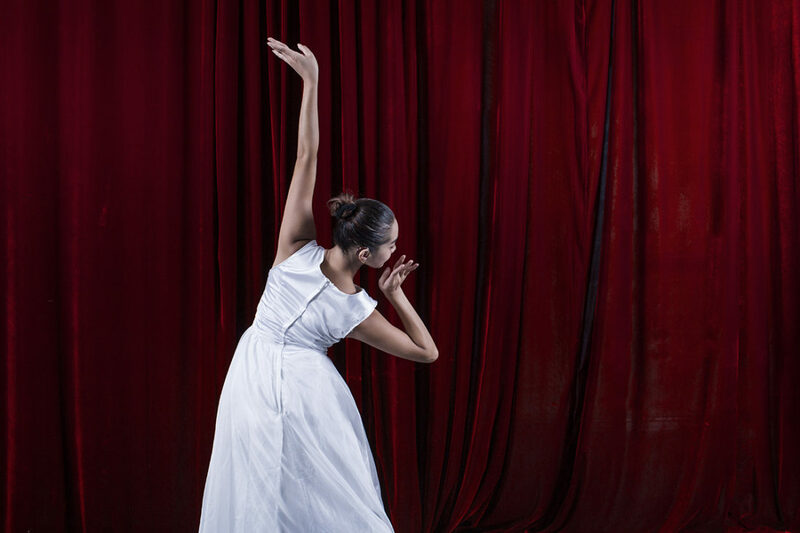 Jiaojiao often incorporates dance movements into her gestures and language. “Dancing comes naturally to me. When I sometimes have difficulty finding the right words, I use my body to express myself.” Jiaojiao turns her upper body to the side and stretches her arm out, extending her fingers towards the ceiling. Then she sinks down, leaps from the floor of the bright training room and glides for a moment through the air, her left arm stretched out above her. She lands gently, relaxes her joints, laughs and prepares for her next pirouette.